Despite the size of my stash, I often find myself reaching for the same darn products to produce the same darn looks, day after day. (In my case: dewy skin; shimmery-peach lid wash; deep brown liner; rosy cheeks and lips. Zzzzzzzzzzzz.) I thirst for inspiration. So I decided to look around for it. I started at home: What is lurking on my shelves, in my cupboards, in my closet–or just in plain sight–that might inspire me? Today, my little collection of Penguin Hardcover Classics immediately spoke to me. The lovely books in this collection–all classics of English literature–were issued by the British publisher, Penguin Books, and designed by one of their in-house super-designers, Coralie Bickford-Smith. Penguin began a revolution in publishing in the 1930s with the introduction of good-quality, inexpensive paperback versions of classic books, sold for a sixpence on the high street. The company’s success proved definitively that there was a large and broad audience for literary works. And I’m happy to say that they’re still at it, issuing affordable classic and contemporary books that are beautiful to look at–and, of course, even better to read. I think any lover of design (and certainly any book lover) would really enjoy checking out the Penguin Hardcover Classics series. The Hardcover Classics are clothbound, with lettering and imagery stamped in foil. In interviews, Bickford-Smith has explained that cost constraints (introduced to keep retail prices affordable) limited the shades of cloth and foil that were available to her. Those limitations make it more interesting, if anything, to look at the cover designs as a group. It’s kind of fascinating to see cloth and foil shades used and re-used throughout the series in various combinations. Each cover feels fresh, unique, in harmony with the rest of the series and–of course–with the pages it encloses. 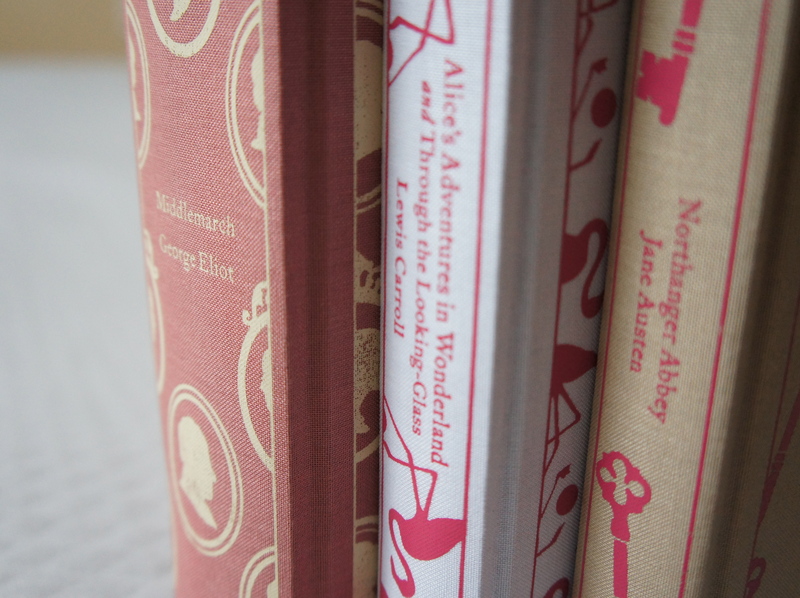 Doesn’t the pink foil on the Northanger Abbey give a drastically different impression when contrasted with white on the Alice in Wonderland cover? Such fun! I chose a few books from the series so that we could enjoy this phenomenon together, and see how it might translate into a few inspired-by makeup looks from my stash. By doing this, I was hoping to explore the less-used, less-loved corners of my stash, and to stretch some of my thinking about looks to try. In coming posts, I’ll put together looks that I hope will tone in with each of these three books. In the meantime, I wish you all the best for the week ahead! Oh, lovely! I love antique furniture. It has so much personality. The bureau where I’m storing my makeup was made by an ancestor of the dearest of friends, so I’ll ask him for permission to photograph it, and then I will certainly share! Thanks so much for visiting!